About - MAURICE D. SMITH JR., PH.D. Learn About Dr. Maurice D. Smith Jr.
Dr. Maurice D. Smith Jr. is the new Assistant Professor and 4-H Extension Specialist at Virginia State University specializing in Citizenship and Leadership Development. He graduated from Virginia State University with a B.S Degree in Agriculture Business and Economics and then completed his M.S Degree in Agricultural and Extension Education from Virginia Tech. He recently completed his Ph.D. in Agricultural and Extension Education at The Pennsylvania State University with research focusing on “Exploring African American High School Age Males’ Perceptions of Agricultural-related Youth Programs in Urban Settings”. Dr. Smith conducts research and assists with teaching in the areas of Youth Development, Urban and Rural 4-H, and Agricultural and Extension Education at Virginia State University and is also assisting as Co-Advisor for VSU MANRRS Chapter. 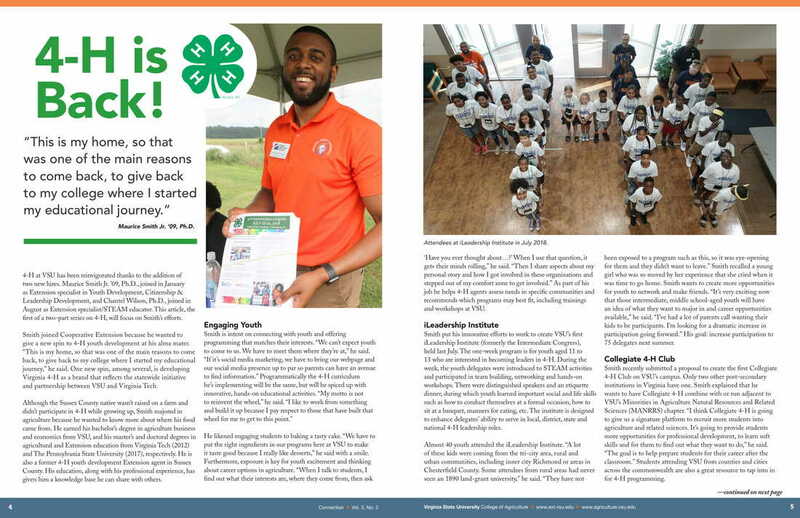 Dr. Smith is also a former 4-H extension agent in Sussex County, VA where he lead various educational programs that meet the needs of urban at- risk youth. Dr. Smith has served for MANRRS on the local level at Virginia State University as social chair and Vice president from 2006-2009; Virginia Tech MANRRS President 2010-2012 bringing the chapter back and growth among membership and awareness; Vice President at Penn State from 2015-2016 supporting the advancement of a new JR. MANRRS chapter and chapter growth among various minority populations on campus. ​Dr. Smith also served on the National Level as MANRRS National VP for Region II for 2 years (2010-2012) while finishing up his master’s degree program. Dr. Smith is also a proud member of Gamma Sigma Honor Society of Agriculture, Minorities in Agriculture Natural Resources and Related Sciences (MANRRS) for over 9 years, an active and life member of Omega Psi Phi Fraternity, Inc., and other professional and civic groups.